On claims by Lusaka mayor Miles Sampa that he was kidnapped yesterday, Lusaka province minister Bowman Lusambo says it’s nonsense; there are no kidnappings in Lusaka. Lusambo says Sampa should stop alarming the nation and scaring away investors and live exemplary as a leader. 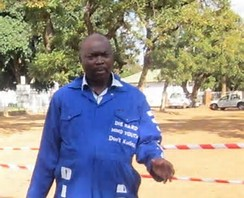 I have been alerted to a news story doing rounds on international media platforms regarding a statement issued by His Worship the Mayor of Lusaka Councillor Miles Sampa to the effect that he was kidnapped by some known elements while undertaking his official duties in the City. As Lusaka Province Minister, I feel duty bound to set the record straight and allay any fears that Lusaka might be unsafe for residents and visitors unlike. I wish to state that our beautiful City remains peaceful as ever and our law enforcement agencies have continued conducting their normal duties. There is and there has never been any cause for alarm. There is no case of kidnapping filed by anyone at any police station in Lusaka or anywhere else across the country. The country that His Excellency President Edgar Chagwa Lungu is governing is peaceful, stable and everyone can freely move across this beautiful country. As a Capital City, we mirror the entire aspirations of the nation and it is important that the international community continues to view Lusaka as a haven of peace as it has always been known. Our resolve is to keep attracting local and international investors to Lusaka in our unwavering pursuit for job creation and prosperity for all. It is therefore important that I forthwith distance the good people of this great City of Lusaka from the narrative that could be created with this episode. For us in leadership, we have a moral duty to portray exemplary traits that do not betray the collective trust and faith that our people have placed in us.